You are here: Home 2012 December Why Should We Care About 10 Gigabit Ethernet Pluggable Optics? All you need to know about XENPAK, X2, and XFP transceivers on Cisco routing and switching products. Why Should I Care About 10 Gigabit Etherenet Pluggable Optics? To deploy 10 Gigabit Ethernet (GE) applications across Cisco switching and routing platforms, a system engineer faces a wide range of options in terms of port types for various reaches and media as well as transceiver technologies across Cisco switches and routers. This quick guide helps you navigate your way through GE technologies on Cisco switches and routers. 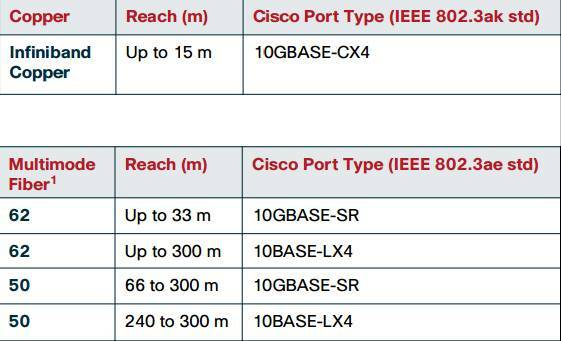 To accommodate an ever-growing spectrum of 10 GE applications, Cisco Systems currently supports eight different port types where each technology is cost-optimized for the reach and transmission media demanded by particular 10 GE applications. Cisco provides three types of hot-pluggable transceivers for 10 GE applications: XENPAK, X2, and XFP. These will interoperate as long as they support the same port type. 2 Actual distance will vary depending on the ﬁber plant characteristics. The following table shows the most relevant differences among the three transceiver types. What are The Benefits of Cisco 10 GE Pluggable Optics? Cisco XENPAK, X2, and XFP transceivers are designed and built according to Cisco speciﬁcations and are compatible with industry standards known as Multi-Source Agreements (MSAs). Cisco transceivers are designed and tested to provide complete hardware integration with Cisco platforms. Cisco pluggable optics, by undergoing a thorough and extensive qualiﬁcation process, are certiﬁed according to industry-leading standards on quality. Q: How much bandwidth is supported per client over the air interface by the Cisco 1941 router? Q: I see there is a 25 Mbps concurrent services the question is how many such concurrent services? A: That is 1941 router’s throughput bandwidth, up to 25Mbps, the total is 25Mbps. all the clients that link to this router, will share it. Q: How many IP phones will support Cisco3945-CME-SRST/K9? A: Regarding C3945-CME-SRST/K9: 3945 UC Bundle w/ PVDM3-64, FL-CME-SRST-25, UC License PAK. This router include PVDM3-64 module, this module shows the support IP phones number. If your IP phone just needs 1 channel & no other device occupy it, then this router support 64pcs IP phones. And need to pay attention to your side switches ports number, it also limit the IP phones number. Q: What cables to connect XENPAK-1GB-LR to GLC-LH-SM? A: Need to use: SC-LC-3METER. XENPAK need SC port, GLC need LC port. Q: I have WS-C3560X-24T-S at hand, but need IP service now, how to get it? Q: How to make ASA5510-BUN-K9 have failover function? A: For Cisco ASA 4510, which part number you need? WS-C4510R-E? Then what engine & software configure with it. And for 3750, which part number you need?